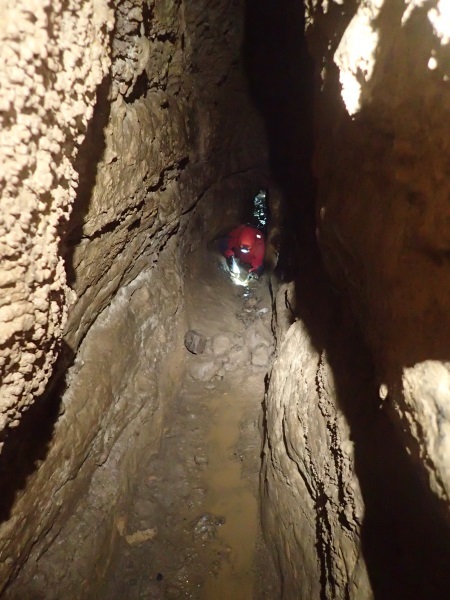 ← Caving – Mole Creek – Tailender … finally! The caves in the Ida Bay and Junee Florentine areas in the south-east corner of Tasmania are typically BIG vertical caves, multi pitch abseils then you have to prussic back up to get out – way beyond what I’m comfortable with. David S suggested that as we were in the south (on a quick trip to Hobart) we walk into Mystery Creek, one of a few “through trips” in the Ida Bay area. The standard “through trip” is to enter via Midnight Hole (6 pitches which would take you some 200m deep into the earth) and then exit via Mystery Creek (no abseils but a few hundred meters of streamway). We would be doing a “bounce trip” entering via Mystery Creek, going to the base of Midnight Hole and then retracing our steps. John O (Jox) who now lives in Hobart, joined David and me for the trip. 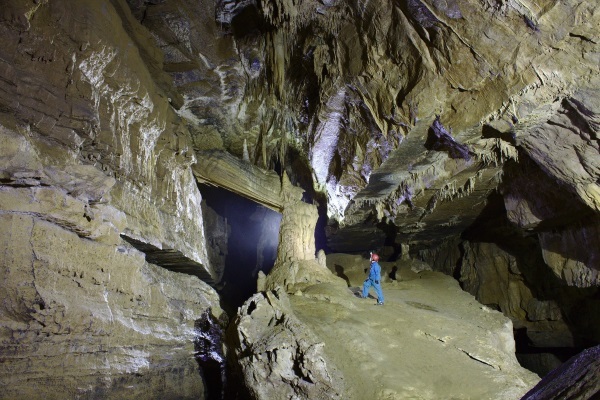 This is a cave that you don’t need a permit for and it’s un-gated, anyone can go in, but there are warnings along the way that tell the public that they should turn back if they don’t have an experienced leader with them … lucky me, I had TWO experienced leaders! To give a bit of background, and I’m able to get it right now thanks to a comment by the awesome Janine McK “Mystery Creek Cave was first discovered in the late 1880s. The entrance was on a survey map of the area in 1891”. They knew of Matchbox Squeeze at the bottom, but it wasn’t until 1968 that they found the Midnight Hole entrance, and, the story as related from David S was that the cavers abseiled into Midnight Hole (the six pitches), they got to the bottom and looked at the squeeze, not sure where it went so they prussiked back up to the top (going up the ropes that they’d abseiled down). At some point, not sure when, someone put a matchbox somewhere at the matchbox squeeze and when they next went into Midnight Hole again and got to the bottom, they found the matchbox and then knew that they could exit via Mystery Creek. As I said, it’s as I was told, might not be right, but makes a good story! To get to Mystery Creek, you walk along an old railway track (rails gone now) that was used for quarrying limestone. It’s an easy k or two to the cave entrance. Probably another 50m into the cave, here I’m looking at a column that has broken off from the ceiling and is resting against the cave wall, the rock I’m standing on probably moved (many years ago), and now has some stals that have grown on the column. (Photo John O). From this point you walk further up the sloping rock until you’re about 20m higher than the stream bed. At this point John tells me that there’s a gaping chasm that we have to cross and right away I’m thinking this doesn’t sound good. I did step across a small rift, and was hoping that was it but unfortunately it wasn’t. We came to a wall that had a pile of rocks in front of it (the wall was about 2.5m I guess), David went up first and reluctantly I followed, climbing up the pile of rocks and then stepping on Jox’s knee to get a bit more height, then David pulled on me and Jox pushed – at this point David says I totally lost the plot … and I did, wasn’t at all happy, but eventually I made it to the top. Sadly (or maybe just as well) there’s no photographic evidence of the climb. 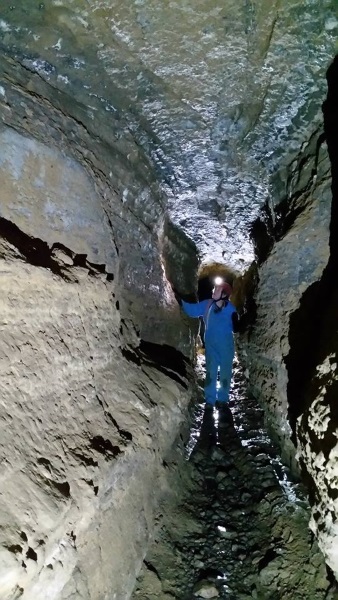 After the climb, I then had to make it through the gaping chasm … 5m of passageway with a 20m drop below me. This image (taken by John O) shows me after I made it across the chasm, and I’m looking ok (I hadn’t fallen down the hole). Finally we’re at the Matchbox Squeeze, 10 or 15m of passageway that was about 150cm high and shoulder wide at the beginning and end and in the middle the only way through was to lay on your side and shimmy through. Here’s Jox coming out of the squeeze, didn’t help that there was water on the floor of the squeeze, I probably soaked up most of it as I went through first! And then we were at the bottom of Midnight Hole (looking up), this is the last pitch, 50m and the dark spot in the middle to the left is the hole you abseil through. Jox and I marvelled at the chamber, then turned around and crawled back. The gaping chasm wasn’t as bad going back, and David helped me to get down the climb (wasn’t so bad getting down with David directing my feet where to go). On the way out, we stopped near the cave entrance (but still in the dark zone), and switched off our head-lamps to check out the glow-worm display, thousands of them, and in some areas so bright that they created a faint glow about 30m away. Amazingly, it took us 1.5 hours (with many stops for photography) to get to Midnight Hole and only 30 minutes to get back to the Mystery Creek entrance. So, now I know that if a through trip ever comes up that I can do it, the abseils would be a piece of cake (particularly not having to prussic back to the top) and I can definitely get through the Matchbox Squeeze! 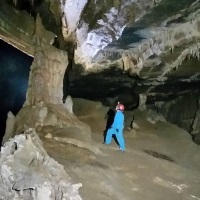 Footnote: In July 2017 there was an accident in this cave, a French caver fell on one of the pitches (a 5m metre abseil). She broke her femur and had to be extracted. There was no way that they could have taken her out through the Matchbox Squeeze (on a stretcher), so they took her back up the pitches, it was a major rescue operation. 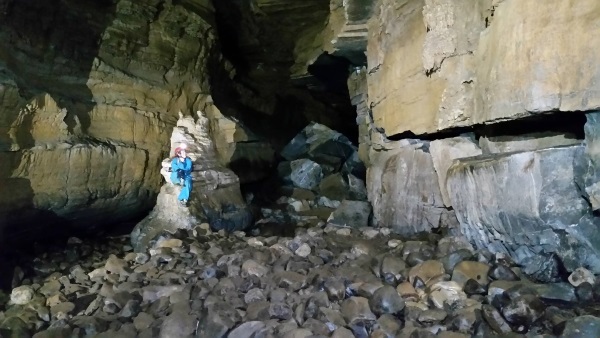 Thank you M for a fascinating look into the scary world of caving. Tasmania is wonderful place to visit hope you did some above ground activities. 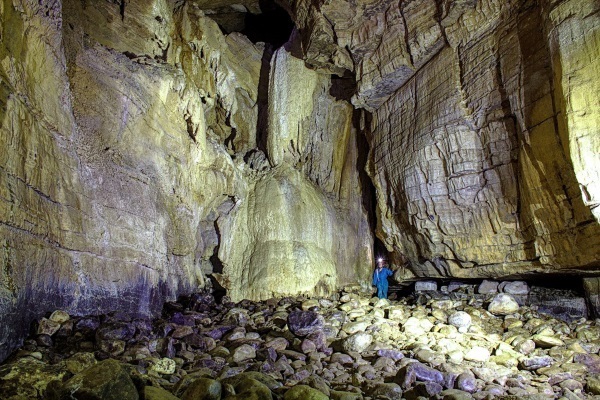 Mystery Creek Cave was first discovered in the late 1880’s. The entrance was on a survey map of the area in 1891. Midnight Hole entrance was found from the top in 1968, although Matchbox Squeeze was already known from the bottom. 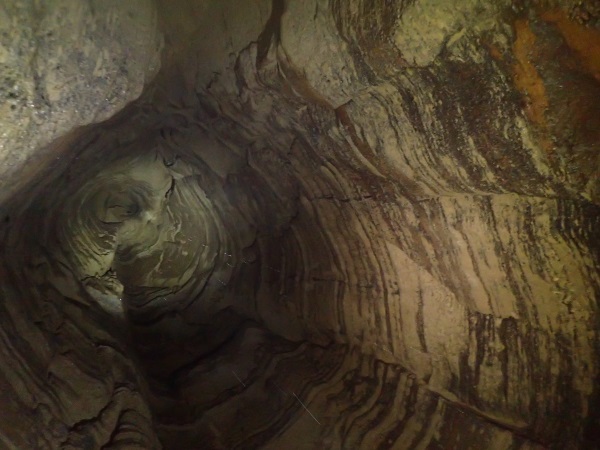 So Mystery Creek Cave (a.k.a Entrance Cave) discovery significantly predates Midnight Hole discovery. Hi Janine, thank you so much for giving a bit of the history, the information I got was third, or fourth-hand. Wow, you are a legend down in Tassie, I am so honoured that you commented on the post, thank you.